My cousin has all sorts of fabulous and interesting eating and serving utensils. She is the only American woman I know who has a set of kedgeree forks. She and her husband, world-travelers that they are, pick up things here and there and once, while in Scotland, they happened into an antique store and saw the unusual piece in the second photo. Now, these two people are not dolts! They know a sardine fork from a herring fork. But they had no idea what this thing was. The proprietor told them it was a kedgeree fork. They didn't know what that was either, but learned that it is a Scottish/British dish, basically rice with fish (usually smoked haddock) and seasoned with curry. An old import from India (dating back to "the Raj") and now a standard item throughout the U.K. Apparently, the original Indian dish (called khichri) was a hodgepodge of cumin-scented rice and lentils (sounds very much like Middle Eastern mujadarah), sometimes with vegetables mixed in. The British added fish and hard cooked eggs and that's the way it's served today. Mrs. Patmore made it for the Crawleys in Downton Abbey and served it to them on a silver, dome-covered tray for breakfast. 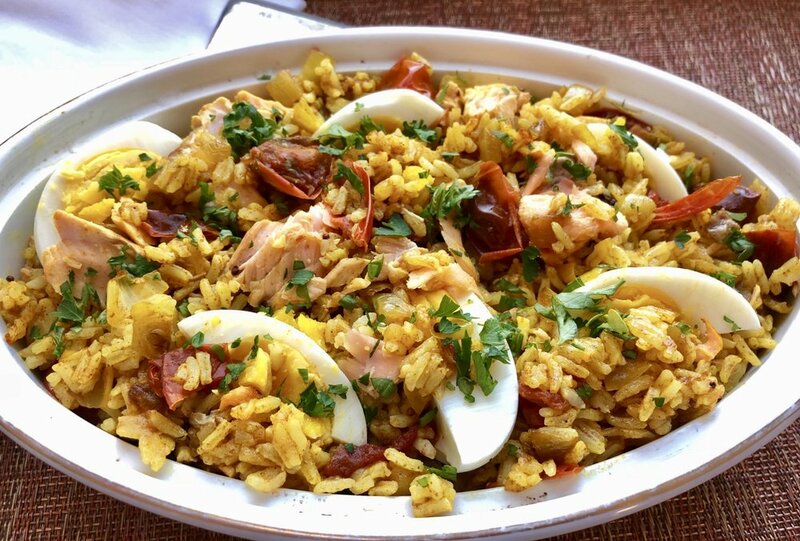 Recently I decided to make kedgeree. It was all because I had a lot of salmon leftover from dinner. OK, I know salmon isn't exactly smoked haddock or even close in taste, but so what! I made Salmon Kedgeree. It made a terrific leftovers dinner and I ate the rest for breakfast the next two days (alas, no sterling silver serving utensils, no kedgeree forks and no person to serve it to me). I've never tasted kedgeree so I have no idea if what I made was the way it's supposed to taste. All I can say is: it was absolutely delicious and I wish I had more and will make this again. Place the rice in a saucepan, cover with the water and bring to a boil over high heat. Boil for one minute, stir with a fork, turn the heat to low, cover the pan and cook for 18 minutes or until all the water has been absorbed. Set the pan aside off heat. Cook the eggs and bay leaf in simmering water for about 10 minutes, or until cooked through. Peel, cut into quarters and set aside. Heat the olive oil in a sauté pan over medium heat. Add the onion and cook for 2-3 minutes or until softened. Add the curry powder, salt and cardamom, cover the pan and cook for 5-6 minutes or until the pieces are golden. Add the tomato and cook for another 1-2 minutes. Remove the bay leaf from the rice and add the rice to the pan. Stir to distribute the ingredients evenly. Add the salmon and lemon juice and cook for 3-4 minutes, stirring occasionally, until the ingredients are hot. Spoon into a serving bowl. Place the quartered eggs on top. Sprinkle with parsley and serve.